who finds great delight in his commands. This past summer I had a tattoo inked on the bicep of each of my arms. 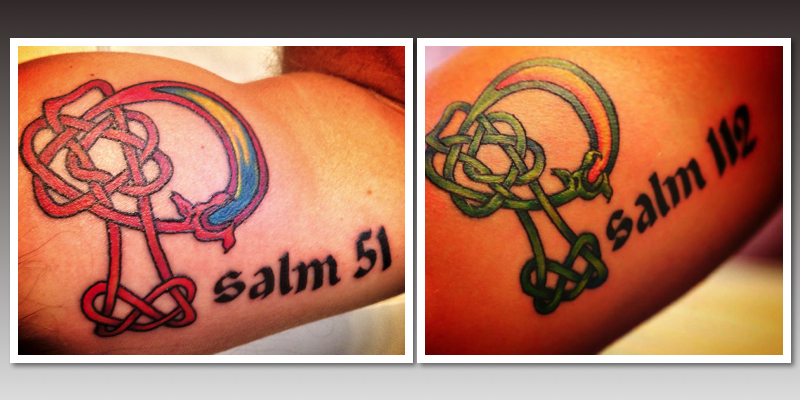 On the left arm the tattoo reads Psalm 51 and the right arm reads Psalm 112. Psalm 51 is a song of confession and through ages the left hand has been associated with folly. Psalm 112 is a song of blessing and through the ages the right hand has been associated with favor. I placed the tats on my biceps because it is a muscle that men traditionally associate with strength. Humility and daily confession that I am broken, make mistakes, and am in continuous need of God’s grace and forgiveness. God’s unmerited favor and blessing as I daily seek to be the man God calls me to be. Confession and blessing. Every day. Every step. Confession and blessing. For those of you who requested it, here is a link to the podcast of my message on June 30, 2013 at Westview Church. I did not think it a particularly good message, but have been informed by my wife that I’m being self critical.